An offshoot of their family business (Organic Connections) Celebration Herbals is located in Canada and is operated by two parents, two children and their dedicated assistants. After having been in the organic herb and spice trade as a wholesale distributor for ten years, they decided to branch into tea blends in 1997. With a focus on creating quality herbal products, Celebration Herbals are on a mission to provide delicious and healthy teas as well as an extensive line of bottled herbs and spices. Celebration Herbals state that organic products sell for a premium around the globe and deservedly so, due to elements such as better tasting and healthier teas which are more environmentally friendly. Offering over 200 varieties of black, green and herbal teas, this tea company also provides loose tea and vanilla beans in their line of bottled spices. There are so many blends to choose from, but what makes this tea company’s products so special, is that they are simple and straightforward, if you’re looking for tea made from single herbs. This is a great way to learn about each flavor profile, before other botanicals are added. Celebration Herbals advise that using spring or filtered water is best when brewing their teas. Celebration Herbals’ Elderberries tea is crafted from juicy, purple/black berries gathered in early Autumn, providing a delicious and fruity cup that can be enjoyed hot or cold. The Latin name for the Elder tree is Sambucus nigra and this natural, organic tea is linked to this tea company’s audit trail for traceability, so you can learn more about the origins and fields that the herbs hail from. If you’re wanting to use the tea for boosting your immune system or for its antioxidant properties, you’ll need to make a decoction by putting one bag per cup in a pot, then cover and boil, before reducing the heat to a simmer for 10 to 20 minutes. 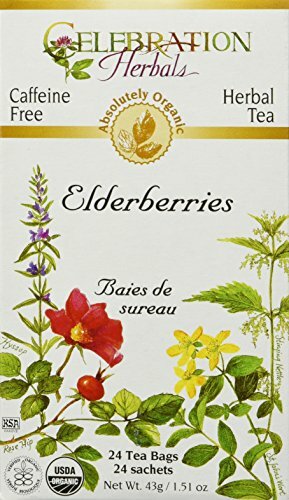 If you just want to brew a delicious cup of elderberry tea, put a bag in a cup of hot water and steep for approximately 5 minutes. The flavor is sweet and slightly smoky, so take a sip before adding honey or sweeteners. 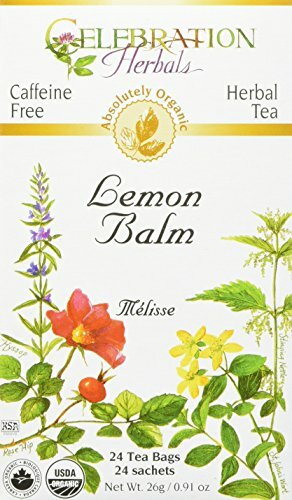 Lemon Balm has been cultivated for over 2,000 years in the Mediterranean area and its genus name is Melissa, which is from the Greek word for bee. The distinctly lemon flavor has a hint of honey, adding a sweet and zesty punch to every cup. Organically grown and prepared, you’ll enjoy the fresh and natural taste of this delicious tea. As this tea is delicate, you’ll need to brew it with boiled water if you want to increase the potency. After 3 – 5 minutes, your tea should be ready to enjoy. Surprisingly relaxing, this tea is sometimes used to bring on restful sleep and can apparently be helpful in preventing colds and viruses. A mellow flavor, this tea is perfect for when you don’t want anything too strong. Anthropologists discovered when they explored the new world that native Amazon people used sarsaparilla extensively and it gained popularity later in the U.S. in the 1800’s. The root of a woody vine, its name comes from the Spanish word for little vine and shrub. Found in Central America, Mexico and Jamaica, this herb inspired the creation of root beer. Made from wildcrafted sarsaparilla root, this tea is mindfully harvested to ensure natural species regeneration. As with the above-mentioned Elderberries tea, if you want a medicinal decoction, you’ll need to place a tea bag per cup in a pot and bring it to boil, then simmer for 10 to 20 minutes. Otherwise, brew one or two bags in a cup for approximately 5 minutes and sweeten if desired, with honey or alternative sweeteners. Some say this tea is diuretic and is good for alleviating the symptoms of coughs and colds. Some tea sippers say that this tea is reminiscent of root beer and is deliciously smooth and satisfying. If you find it too strong, either brew it for less time or mix it with chamomile tea. Celebration Herbals have a wonderful variety of simple, organic products that include wonderful herbal teas, but it’s worth mentioning that their black and green teas are also high quality and organic. They have an Herbal Wisdom blog that’s worth checking out, if you’re interested in learning more about healthy living.